Making Stuff is a unique DIY YouTube channel that showcases some of the projects that are built by it's creator, Bob. It's not meant to be a how to channel, but more of a place where you can hangout with Bob while he creates, designs and makes his contraptions. Occasionally, some of the projects will have more to them than what is found in the videos. This is the place where you can find that information. The Sortimo styled organizer on a budget. 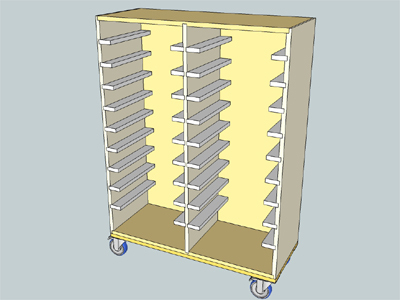 Built from wood and 3D printed parts, this organizer uses Harbor Freight storage bins to store all sorts of screws and small parts. Please subscribe to the Making Stuff YouTube channel so you don't miss an episode. Also, please give our videos a thumbs-up or thumbs-down on YouTube. By doing so, it lets us know what type of projects our viewers are interested in watching. © 2019 - TMI Enterprises Inc.